Dansc: Well, let me start by suggesting the obvious choice of M5 (a). Next we should look at attacking either the left side or the bottom, whichever black doesn't protect next. FireclawDrake: I think, if we're aiming to protect the cut, a move at L5 (b) serves the same purpose and helps us a bit more if we need to run. tapir: c is another, maybe bad choice. White feels like dozens of points behind mainly because of the handling of the running group. kanzenryu: White Resigns. This may be a little controversial, but I am going to strongly advocate resigning at this point. We seem to be running out of enthusiasm to make moves in a reasonable timeframe. I've enjoyed the game a lot, learned a few things, and I think it would be better to resign and start a fresh game than to continue slowly when we are so far behind. Thoughts? FireclawDrake: I am in favour of resigning and starting a new game. I'm loving this game format. Dansc: I'm up for resigning, as long as we start a new game as soon as possible :) Then again, maybe we'd like to try a last big fight before resigning, perhaps at (e), (f), (g) or (h). We can always make life with (d) later if this group gets in too much trouble. Dansc: We have a few possibilities here. I'm going to start by proposing a) D5. We need to protect against the cut, the bamboo joint doesn't give black any forcing moves, and it avoids inducing Black to strengthen his . kanzenryu: b) d6 This should also protect the cut. Andy: c) D3. Go ahead and cut. kanzenryu: If the enthusiam of the white team is fading then maybe we should consider resigning. tapir: I prefer a now. But c later. Dansc: Another vote for the obvious a). I think we should be looking to keep the black left side well separated from the bottom and strike there as soon as possible. kb: White needs to use the thickness for attacking. This is a thick play. rmsp: d) L8, to cramp black's shape in hopes of an attack. We're going to have to give our captains lots of options here in the middle game! Andy: I think a) is the only move, but I'm also going to suggest b) S2 settling locally. a) is good because it means black has violated the proverb of don't peep at bamboo joints. ThorAvaTahr: I agree. After this white shape is finished, black has the choice to fix his shape or to take sente leaving a weakness behind. Andy: I agree with the move made, but would like comment on whether in this shape under some conditions the move at b is also possible. b invites a ko. If white wins the ko, white has two eyes and if white loses the ko, white doesn't have any eyes. With the move at a, if black gets a play at , then the white group has only one eye and needs to run. I think this doesn't work for black right now because there is too much aji around . In other words, defending around and are miai. Supposing white were komaster, is the play at b rather than a then correct? ThorAvaTahr: To answer your question I think we need Bill's advise, however in principle I think that s4 is generally a bad idea, unless you urgently need to make life in ko. And even then only if you can win the ko. However, i am not sure I have sufficient knowledge to answer acurately. Herman: Quick note: If white needs to live, the descent instead of the connection at a would do the trick in this position. Similarly, the bend at would give life (while allowing black to capture a stone with a). kanzenryu: a) s5 ensure the white base. Andy: c) s6. Prevent the eye stealing tesuji. ThorAvaTahr: c is more active then a (s5); b(s10) does not make points and does not play on our weakest side. The difference in eyespace for white playing c(s6) or black playing a is too big. 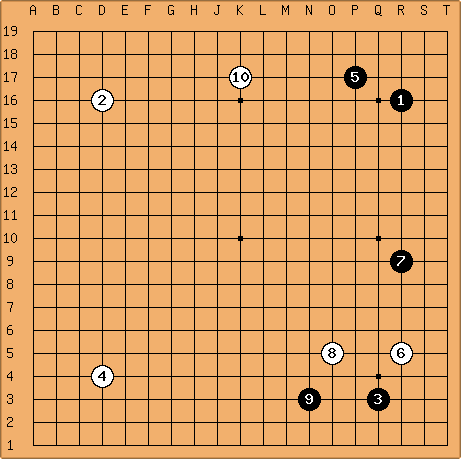 kanzenryu: a) s7 prevent an eyemaking base. rmsp: b) q5, connect against the peep. ugly but effective. ThorAvaTahr: Correct shape, we cannot allow to be cut, here. Andy: There are fancier ways to connect against this peep, like this alternative . Is this too fancy? ThorAvaTahr: Too fancy indeed, imo. It bearly even works. Black can allready cut although he probably wont, but any move black makes threatens to cut. We don't want that kind of legacy unless we gain something very big. Here I don't see what it is that we gain. Also, please appreciate the fact that the actual move is good shape, we connect and at the same time make eyeshape. Andy: a) L4. If black wants to be (has to be?) pushing from behind while we isolate the weak black dragon, that sounds ok to me. kanzenryu: b) L8. Niggle away at the weak black group. tapir: c) C6. Always a possibility. I would play a). L8 doesn't coordinate well with in place imho. rmsp: d) J10. Leave the exchange as forcing and cap. kb: This move is purely based on direction of play. It is of strategic importance for White to be running the show, since after White's group is significantly stronger than Black's. If more central influence can be made from attacking, the left Black group can be made thin, thus finding an appropriate response against . kanzenryu: Doesn't this make us vulnerable to the TowerPeep ? kb: Much much later perhaps, but White's shape is superior now, so the tower peep will give Black an inferior result. unkx80: For this position, a tower peep is an overplay. However, if White fears the tower peep, then may be played one point to the left. Andy: b) M4. White's biggest asset is the weak black group . Attack from a distance. kb: This move is a difficult one to decide upon. Andy's intuition is correct in that the marked Black group is what White needs to use in order to stay in the game. The direct attack L8 actually ends in gote with a correct Black defense. C6, F4, and H3 also end in White gote and then Black gets to play in the center first; this would certainly put White in an unfavorable position (I believe White is behind because the exchange / heavily favors Black). White needs to use the initiative. I think is an overplay in that Black should use one more move to secure the center dragon and rely on superior territory to win this game, but it is certainly a difficult overplay to punish. ThorAvaTahr: b) This move finishes the corner, unlike F16, which is open underneath. (don't count on any help from the 10-3 stone). Tenuki is inconsistent here, because a black move around E16 would be a sever attack on both the corner as the center stones. kanzenryu: a) m14 I don't know why, I just want to play at this point. kanzenryu: I take your point, and had already wondered about some sort of attacking move on that group from below. But my personal experience from my games is of so many big groups like this one that almost lived ;-) I would not have thought of our group as strong. Just an example of less experience and judgement. Andy: b) C16. I think the usual keima at F17 is too soft on black in addition to extending in the direction of black's strength, nevertheless, white needs this corner or we fall behind too much in territory. C16 gives black the C12 invasion to worry about without giving black too much of an excuse to do anything immediately about it like an attachment at C15 would. rmsp: c) to give our corner stone some options, reach out to our dragon, and aim at later invasion at c12. I think hoping for territory in this corner (with b or the low extension) is inconsistent with the 4,4 play and difficult given black's strength to the right. ThorAvaTahr: b) I think Andy's idea here is ok, since we cannot get sente here anyway it may be best to try to get either a big corner or a fight on the other side. If we extend to 46, after black 42 we cannot answer at 33, since it gives black ideal shape after he plays 84. But we do not have a nice alternative option for 33.
kanzenryu: a) q13 working on eyeshape. Andy: b) C12. helps group, extends in the direction away from black's iron pillar - . tapir: I seldom see similar positions in my games. I propose c) (R7) to unsettle the black group. Threatens connection underneath. If black connects against it, the forcing moves agains this connection should be enough to settle easily. It may still be a slack move, but thank god I'm no captain. rmsp d) let's keep our head out. Andy: b) Q13 I like a), but I'm going to suggest b) attaching to the black stone to settle the white group locally. In conjunction with , the white group is almost alive and white can get back to the main game. Running out with this group does not appeal to me because white is going to play a lot of dame while black destroys the top and gets influence over the rest of the board. The downside to attaching with b) is it pretty much eliminates any residual aji in the upper right corner. I don't think tenuki is an option for , even though I really love Bill's proverb. kanzenryu: c) L11 another option to continue towards the centre. kanzenryu: Let's have some more suggestions for the white team. New members feel free to join! ThorAvaTahr: a) I was waiting for more suggestions but they didn't seem to come. 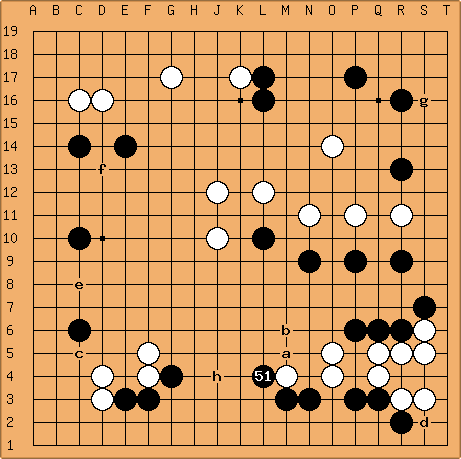 This move tries to get out without reinforcing black's stones. kanzenryu: a) o14. Try for some eyespace, head towards connecting at the top, push into what could become a black moyo. Andy: b) L11. I think something has to be done with the three white stones. Attaching on top of is a shape-making defensive move. Although black gets stronger, since the black stones can already cross-under it's hard to harass these stones effectively anyway. kanzenryu: Come on White team, we need more suggestions! ThorAvaTahr: a) Here I found a difficult choice. However, I do not want to attach to the black group, making it stronger, since it might still be attackable. Secondly, I will never run with a keima, since it leaves a cut. I chose a) because it makes some shape, although not my personal choice. I do not feel it is much of a reducing move though. tapir: Oh, i forgot to propose P13, like to hear a comment. Andy: a) S3. The usual idea. Make a base. Since the goal was to settle these stones, we might as well settle them all the way. I think white is doing pretty well in this game so far. kb: Good, only move again. Good shape inside your opponent's influence is necessary. Andy: b) Q4. Make shape. Although if the stone at O5 were not in place a move at a) or a crosscut would give white nice sabaki possibilities. kanzenryu: Black is really motoring lately. Maybe they prefer a faster pace. rmsp: c) S3 feels more dependable. If b), we have to be able to respond to b S3 atari with P3, and I think that would leave us very thin. unkx80: It is the Black soldiers that are making suggestions at a rather fast pace. When I make my rounds at the recent changes page, I thought, whoa, I better make a move. kb: Q4 - standard move here. Makes miai of good shape in the corner and against N3. If at S3, B Q4 disconnects White from O5 and makes White play R2. R2 directly is very light shape and is also a good move - it's considerable. a) Andy: R3. Settle this group. b) tapir: I prefer a) but for an alternative i propose P13 once more. Now with in place the tower peep doesn't work anymore. kb: Only move - these stones are now thin and must be settled; The only way to settle these stones is to enter the corner. The corners are the biggest places on the board, so Black playing in the corner here after getting in means that White's stones would be floating. Playing at R4 instead might be premature, since White will take sente to play at . Jumping out with the two stones here is not good for White, because then Black's central weak group splits two White weak groups; not good for White. It's better to settle one directly and then worry about the other later. kanzenryu: what is black likely to do? at q4 worries me. a) tapir: P13. Stabilizing on the outside and isolating the two black stones. b) kanzenryu: N11. Jump again as if I knew what I was doing. kb: Now that we're required to play here, another one-space jump is best. S16 makes a play at P13 impossible, because then the tower peep is severe. That being said, playing directly at S16 is too soft on and . kanzenryu: If black plays a pincer at the marked stone, should we jump towards the center or do something else? MrTenuki: The one-point jump is an obvious first move to think about (cf. the one-point jump is never bad). But the question is whether Black would peep from above or from below with to make White heavy and then attack the two White stones at the bottom right. Then again, it seems strange to me to invade with only to sacrifice it immediately-- so I would consider attaching at b as another option. Tapir: The peep would be a thank-you move imo because it removes the possibility to connect by attaching to on the second line. Tapir: Imho opinion the idea is each of us chose one (or if there is not enough contribution maybe two) moves and let the captain decide. If we propose half a dozen moves each, the soldier role becomes totally irrelevant. kb: Please, everyone, make your proposed choice(s) for below (in coordinate format), with a short reason. You can move the above discussion if you wish. I don't see any clear choices from the above except for one or two options. kb: I don't like any of these options. Out of them, though, I choose P11. Playing on the side with more potential is bigger. To be fair, I don't agree with either - personally, I think the / exchange is good for White. Most professional games with the shape on the right side have tenuki as the primary move - this is because professionals treat / as a kikashi and then leave it. Think about it - you want to play in the biggest area. The side is not particularly urgent after because both White groups are very light. Attaching at Q13 is an overplay and strengthens Black in the corner, making it impossible for White to get anything in the future. Black will surely respond with an immediate cut (Q12) or with a bump (R12). a) Tasky: since the wedge on the right side has miai for a base (C13/C7), I think it is best to tenuki from it an play the counterpincer at R11, that will be my proposal. b) Tapir: I have no idea what to do on the right side, the counter pincer is proposed already. So this big enclosure (C14) with at least some pressure to . Looks better than 2 or 3 space extension corner-wise. c) MrTenuki: I did consider both C14 and R11. I also looked at C12 and C13, but either could invite a cap followed by a 3-3 invasion. So, another option is to approach from the bottom with a move around C8 as an inducing move-- if Black approaches the corner as a response, then White could try to settle the top in sente. d) kanzenryu: Black will likely gain much of the right side, so playing at Q10 can start a reduction sequence. e) kanzenryu: I am so clueless about what to do around the edge of the board that I'm just going to give Tengen as a possibility. f) Andy: I think c) is the correct direction, but I prefer to hold back one space to make the corner more solid. Something like C7, black approaches the top hoshi, white makes a 1-space high extension, black slides, white blocks. Then black probably approaches from the bottom, but as discussed, that's not particularly interesting for either side. kb: I chose R11 because I do not know what the best checking extension or enclosure on the left side is (perhaps no one has suggested it yet!). R11 has been played in a professional game before, although it was 103 years ago. a) M4 by tapir - we shouldn't fear to make proposals, someone else has to decide anyway. m4 looks natural. the usual counterpincers don't look good here imho. b) kanzenryu s3 - compete for the corner, start a base. d) MrTenuki: I actually did consider a counter-pincer at R11 since that leaves room for a two-space extension if Black jumps out, but that could result in quite a mess on the right side. So, among the three moves already suggested, I would prefer M4. kb: I like either R11 or K17 here, but I'd rather have a peaceful game than a fighting one, so K17 it is. Professionals have played both in actual games. Since this is a teaching game, I thought I should share why I don't like the other three moves. S3: This move is not good as it makes and more heavy - after S3, cannot easily be discarded. Besides, locally there is a better move. D10: This move would probably be fine, and in an actual game may not make a large difference. However, Black will switch to the top side and take the big point there. An even exchange; however does much to undermine White's sanrensei strategy. M4: Pressing builds up strength, but then would be ideally placed to limit White's thickness, and the strength would be wasted. It also might eliminate further opportunities in the corner. b) kanzenryu S3 - plenty of room to run out later, so take a chunk of the corner with good shape. c) MrTenuki O5: Another possible response to the three-space low pincer. kb: is a light and flexible move that will also allow White to get sente and play somewhere else; Black's follow-up is not so dangerous with such a light pincer. S3 will likely require a follow-up move, and is usually not a good move against komoku in most cases (better to attach). O4 - starting the taisha where Black has an extra stone is not normally a great idea, but I don't know the taisha well enough to tell you how that stone will aid in the fighting. a) R5 kanzenryu: prevent two black shimari. b) R10 MrTenuki: is another obvious choice. ThorAvaTahr: Why is it obvious? MrTenuki: My original thinking boiled down to this: "R10 is a natural extension point for Black's upper right shimari. With R5, Black might be able to get a pincer + extension." But after looking at the board again, I realized that I was getting the position mixed up with the orthodox fuseki, where Q3 is at Q4-- which would mean that there is no second shimari to prevent. In this position, the pincer + extension isn't quite as good as in the orthodox fuseki: R10 doesn't count as a pincer, and if Black tries a 2-space or 3-space pincer, the "extension" would be a bit too far from the upper right shimari. c) K4 Tapir: K4 is possible as well. ThorAvaTahr: Prevents black to make two shimaris. This move is played by professionals, however the high approach is by far more common. As a general guideline if the opposing corner is black white would approach high, if the corner is white, white will approach low. Perhaps the idea of the high move is to be light and always have a quick way out. K4 and R10 are both not played by professionals. R9, however, has been played, but it is very rare. b) D3 kanzenryu: for variety. a) D4 MrTenuki: Part of me is really tempting to be aggressive by approaching either B1 or B3, but I won't-- so D4 it is. And if Black approaches with F3 with the idea of playing something that resembles the Kobayashi fuseki (with the exception that is shifted one line to the right), I'll play a pincer with . kb went to the star point. Actually, if you were to choose a komoku here, it's better to pick one to the left of , so the strong side points towards and the weak side towards the strong side of . Otherwise, it encourages Black to make symmetry on the bottom and gain a strategic advantage. c) D4 MrTenuki: D4 is another obvious choice. Then again, I personally like the idea of D16 because it prevents Black from playing out a Chinese opening. ThorAvaTahr: Like this and continue or do we need a new diagram? is a basic move, it very common in professional play. It has the virtue of flexibility. The other moves are also possible, at this stage no normal move can be really wrong. However, personally i would not like to play such that the open side(4th line) of my 4-3 stone faces the closed side of the oponents 4-3 stones. I think white is behind in this diagram and is too well placed.